It’s official. We have a new comedy love in our life, and it’s an absolute beauty of a show all the way from Derry. Or, as nominal lead protagonist, 15 year old Erin Quinn puts it in the opening episode of Channel 4’s surprise new sitcom smash of this year, ‘Londonderry, depending on your persuasion’. 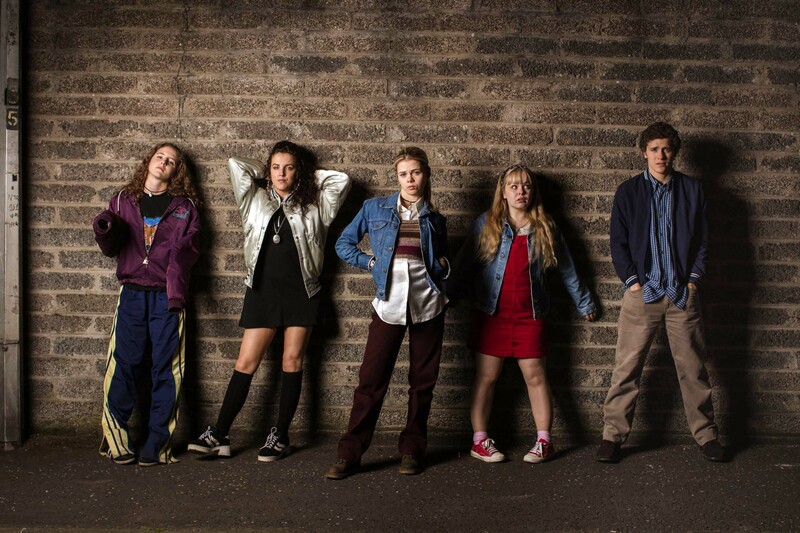 Written by Lisa McGee, whose previous credits include Being Human for BBC Three, and London Irish for Channel 4, Derry Girls is a six part sitcom, set in the midst of the Troubles in Northern Ireland in the early 90s, and focusses on four teenage girls – socially awkward misfit Erin (Saoirse-Monica Jackson), her spaced out cousin Orla (Louise Harland), dweeby Claire (Nicola Coughlan), and gobby, streetwise Michelle (the fabulous Jamie Lee O’Donnell). Oh, and there’s the latter’s cousin from England, James (Dylan Llewellyn), who’s moved over to Derry with his now divorced mum (and Michelle’s auntie) but is sent to the same school as Michelle and the others, on account of the fact he’s likely to be ‘duffed up’ at the all boys school up the road. Because oh yes, their school is an all girls’ convent school (which makes for an interesting scene in the first episode where James ends up having to use a bin in place of an actual loo to relieve himself). The series charts their hilarious teenage misadventures – ranging from a botched attempt at getting funds for a school trip to Paris, to a Ukranian exchange student being more than meets the eye – and is at once a fascinating yet nostalgic insight into life in the early 90s (right down to it’s EMF and The Cranberries soundtrack), as it is a realistic depiction (as many real life Derry girls and boys have observed since the series started airing in January) of life during the Troubles. It’s particularly true of scenes like the first episode, where the girls find themselves summoned to the office of the school’s principal, the wonderfully acerbic and deprecating Sister Michael (Siobhan McSweeney) after a scrap with goody two shoes prefect Jenny (Leah O’Rourke) on the morning bus. When Claire almost hyperventilates with fear at the possibility of them being expelled over the incident, Michelle is quick to point out that a class mate called Rhonda Gallagher was in the IRA, and didn’t get expelled. ‘That’s probably why’, responds Erin. 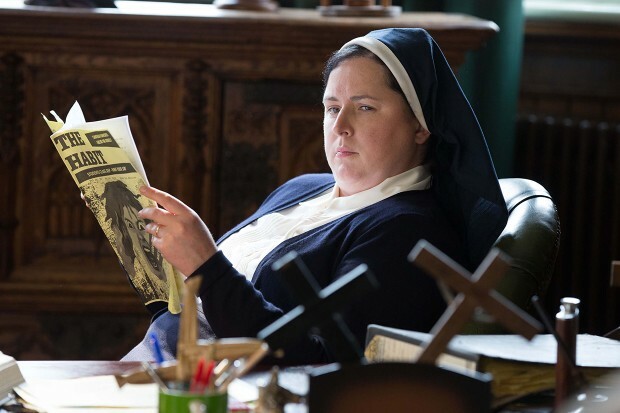 It’s also true of later that episode, when Erin’s mum, the formidable matriach Ma Mary (Tara Lynne O’Neill) comes to collect a disgraced Erin and Orla from Sister Michael’s office, albeit later than expected, owing to a road being blockaded off because of an undetonated bomb: ‘Don’t they have the wee robots to do all that now?’ As she is someone who lived through life in Derry in the 90s, Lisa McGee’s writing is believable and wonderfully deadpan, and shows that life and all its day to day frustrations still went on regardless of the terrifying backdrop. But there’s a creditable undercurrent in other areas of the series, such as in the second episode, when a Friday night visit to Fionnula’s chip shop is conducted with all the nervous scientific calculation of ordering food in such a situation. Or when Sister Michael, midway through a school choir runthrough of ‘Love Is All Around’ in assembly, quietly suggests to the music teacher mid performance that it’s never performed again for her own sanity. Coming on like Ja’mie: Grammar School Girl meets Father Ted, and already commissioned for a second series next year, Derry Girls is a must watch for it’s wonderful characterisation, superb performances and dead on the mark scriptwriting. In the words of Michelle, you’re a d***weed if you miss out on this. The complete series of Derry Girls is available for UK viewers to watch now for the next three weeks on All4.